Engaging with Climate Change (2012) is one of the first books to explore in depth what climate change actually means to people. It brings members of a wide range of different disciplines in the social sciences together in discussion and to introduce a psychoanalytic perspective. The important insights that result have real implications for policy, particularly with regard to how to relate to people when discussing the issue. “By bringing together some of the most cutting-edge and creative thinkers on the ecological crisis, this anthology builds a persuasive case for how a greater understanding of human psychology — including the psychology of denial, compassion and cruelty — can help break the climate deadlock. A powerful riposte to the notion that climate communicators have only two options: relentlessly terrify the public, or try to fool them into action without mentioning the word “climate.” – Naomi Klein, author of This Changes Everything and The Shock Doctrine. “This book tackles the fundamental psychological question how do we respond to the warnings about climate change?” Clive Hamilton, author of Requiem for a Species. “This book helps us see the complex psychological reality that underpins the greatest political problem of our time”. Ro Randall, co-author of In Time for Tomorrow. “Weintrobe’s project promises to inspire new perspectives on climate change and hope for action”. Richard Brouillette, New Books in Psychoanalysis 2015. 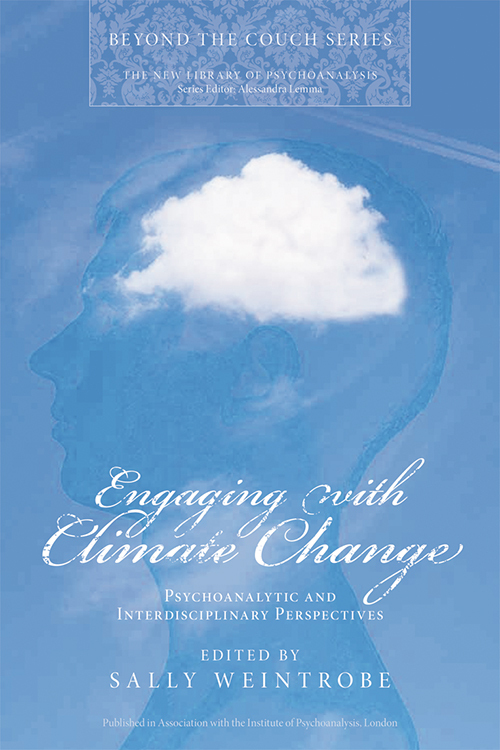 Engaging with Climate Change was short listed in 2014 for the International Gradiva Award for contributions to psychoanalysis. Jon Alexander MSc, is co-founder and Director of the New Citizenship Project, a social innovation lab with a focus on creative initiatives that engage people as citizens rather than as consumers. Examples include MyFarm, a project which saw the National Trust hand over decision making on a real working farm to the public via online vote and deliberation, and Project Wild Thing, a feature length documentary film about children and nature. Ted Benton is Professor of Sociology at the University of Essex. He has written extensively on philosophy of social science, history of the life sciences, social theory and Marxism. Since the 1980s, his main focus has been on re-working the heritage of left theory in response to ‘green’ thought and practice, and since 1992 this has been taken further through collaboration with others in the Red-Green Study Group. He is a well-known photographer and writer on natural history. Erik Bichard is Professor of Regeneration and Sustainable Development at the University of Salford in Greater Manchester. He has spent a career in four different sectors exploring the conditions for sustainable change in organizations and in individuals. His latest book ‘The Coming of Age of the Green Community’ published by Routledge explores the reasons why people come together to fight for pro-environmental outcomes, and the changing conditions in which they operate and thrive. Michael Brearley, psychoanalyst, is a Fellow of the Institute of Psychoanalysis in London, where he was also President. He works as a psychoanalyst in private practice. He has been a Lecturer in Philosophy at the University of Newcastle-upon-Tyne and a professional cricketer, captaining England. He has written and lectured in the areas of psychoanalysis, philosophy and leadership and is author of the book The Art of Captaincy . Irma Brenman Pick , psychoanalyst, trained fi rst at the Tavistock Clinic as a Child Psychotherapist, then at the Institute of Psychoanalysis in London as an Adult and Child Psychoanalyst. She is now a Distinguished Fellow, Senior Training Psychoanalyst and Supervisor of the Institute of Psychoanalysis, where she was also a past President. She has a particular interest in the subject of diffi culties in coming to terms with painful emotional experiences. Stanley Cohen was Professor of Sociology at the London School of Economics. He wrote about states of denial, criminological theory, prisons, social control, criminal justice policy, juvenile delinquency, mass media, political crime and human rights violations. He worked on The Distant Other, a collective research project about humanitarian communication. Tom Crompton , PhD, has worked for nearly a decade with some of the UK’s best known charities on values and social change. He has advised the UK, Scottish and Welsh governments on issues related to cultural values, has collaborated in research with some of the world’s foremost academics working in this area, and has published numerous articles on cultural values in both academic and popular journals. He is a founding director of The Common Cause Foundation (www.commoncausefoundation.org). Clive Hamilton is Professor of Public Ethics at Charles Sturt University. He has held visiting academic positions at the University of Cambridge, the University of Oxford and Yale University and is the author of several best-selling books, including Growth Fetish, The Freedom Paradox and Requiem for a Species: Why We Resist the Truth about Climate Change . Stephan Harrison , PhD, is Reader in Quaternary Science at Exeter University and a Senior Research Associate at the Oxford University Centre for the Environment. He is Director of Climate Change Risk Management. With a background in quaternary science, since 1991 he has wworked on glaciers and climate change. Bob Hinshelwood , psychoanalyst, is Professor in the Centre for Psychoanalytic Studies, University of Essex, and Fellow of The Institute of Psychoanalysis. He was previously a Consultant Psychotherapist in the British National Health Service and Clinical Director of the Cassel Hospital in London. He has written extensively on Kleinian psychoanalysis and also on social and political issues of various kinds. Paul Hoggett is Professor of Politics and Director of the Centre for Psycho-Social Studies at the University of the West of England in Bristol. He is also a practicing psychoanalytic psychotherapist, a Member of the Severnside Institute for Psychotherapy and Associate Member of the Lincoln Centre for Psychotherapy. His most recent book is Politics, Identity and Emotion . Psychoanalysis in London and works as a psychoanalyst. He was formerly a member of the Senior Staff of the Tavistock Clinic, where in addition to clinical commitments he taught on its Institutional Processes programme. His interest in the planetary ecosystem combines his fi rst academic studies in geology with later degrees in philosophy and psychology. He has an interest in the functioning of groups, organizations and political processes and he consults to organizations on the impact of unconscious processes on their functioning. Johannes Lehtonen , MD, is a psychoanalyst with the Finnish Psychoanalytical Society and Professor Emeritus of Psychiatry at the University of Eastern Finland. He was chairman of the Finnish Psychiatric Association, 1996–1999, and Dean of the Medical Faculty of the University of Eastern Finland in Kuopio, 2004–2007. He has published on neurophysiology, psychiatry and psychoanalysis, focusing on mind-brain relationship in infancy, and also on human responses to climate change. Renee Aron Lertzman , PhD, is a senior research fellow at Portland State University. Her work is concerned with the relations of psychoanalytic research and theory with contemporary environmental crises. She is Special Editor of Environment and Sustainability for the journal Psychoanalysis, Culture and Society and is currently working on a book, The Myth of Apathy, based on her doctoral research. Angela Mauss-Hanke , PhD, is a Training and Supervising Psychoanalyst for adults and groups with the German Psychoanalytic Association (DPV) in Munich and a child psychoanalyst. She has written many psychoanalytical papers on topics relevant to society, e.g. ‘The killing of the So-called Handicapped in Germany and the Nuremberg Medics Trial 1946/47’ (2000); on 9/11 (‘The Low Voice of Sanity’, 2004); about revenge and school shootings (‘Revenge Doesn’t Know Its Bounds’, 2009) and on ‘National Socialism and Its Impact on German Self-conceptions Today’ (2011). Margaret Rustin is a Child and Adult Psychotherapist and an Associate of the Institute of Psychoanalysis. She was Head of Child Psychotherapy at the Tavistock Clinic for many years. She has a special interest in thinking psychoanalytically about literature and has co-written, with Michael Rustin, Narratives of Love and Loss: Studies in Modern Children’s Fiction (Verso 1987; repub. Karnac 1999), and Mirror to Nature: Drama, Psychoanalysis and Society , Karnac: Tavistock Series, 2002. Michael Rustin is Professor of Sociology at the University of East London, Visiting Professor at the Tavistock Clinic, and an Associate of the British Psychoanalytic Society. He is author of The Good Society and the Inner World (1991) and Reason and Unreason: Psychoanalysis, Science and Politics (2001), and co-editor of Social Defences against Anxiety: Explorations in a Paradigm (2015) and After Neoliberalism? the Kilburn Manifesto (2015). John Steiner, MD , is a Senior Training and Supervising Psychoanalyst for the Institute of Psychoanalysis in London and works in private practice as a psychoanalyst. He is the author of several psychoanalytic papers and the editor of several books, and he has written two books. The fi rst, Psychic Retreats (1993), describes how patients may withdraw to defensive organizations, which protect them from anxiety and loss. The second, Seeing and Being Seen (2011), describes the situation of patients emerging from a psychic retreat. Jukka Välimäki , MD, is a Training and Supervising Psychoanalyst, former chairman of the Training Institute and past President of Finnish Psychoanalytic Society. He has acted as the Finnish editor for the Scandinavian Psychoanalytic Review (1979–1989) and as a member of the editorial board of the Finnish Psychoanalytic Society, publishing psychoanalytic books in Finnish. He has written and lectured on psychoanalytic and psychotherapeutic technique, as well as on our responses to climate change. Bob Ward is Policy and Communications Director at the Grantham Research Institute on Climate Change and the Environment at the London School of Economics and Political Science (chaired by Nicholas Stern, author of the influential Stern Review on the economics of climate change). Bob joined the Institute in 2008 from Risk Management Solutions, the leading provider of computer models for quantifying the risk of catastrophic events, where he was Director of Public Policy. He previously worked at the Royal Society and the UK National Academy of Science, where his responsibilities included leading the media relations team. Sally Weintrobe, psychoanalyst, is a Fellow of The Institute of Psychoanalysis in London. She was formerly Chair of its Scientific programme, a Member of Senior Staff at the Tavistock Clinic and Hon. Senior Lecturer at University College London in the Department for Psychoanalytic Studies. She has written on entitlement attitudes, grievance and complaint, prejudice, greed, climate change denial and our relationship with nature. She edited and contributed to Engaging with Climate Change (2012), and is currently writing a book on the culture of uncare. Chris Rapley CBE (who wrote the foreword) is Professor of Climate Science at University College London. His previous posts include Director of the Science Museum in London, Director of the British Antarctic Survey (BAS), Executive Director of the International Geosphere-Biosphere Programme (IGBP), and Professor of Remote Sensing Science at University College London’s Mullard Space Science Laboratory. He recently worked with the award winning playwright Duncan Macmillan and theatre director, Katie Mitchell to write and perform the play ‘2071’ at the Royal Court theatre in London and the Deutsches Schauspielhaus in Hamburg. The book ‘2071 – the World We’ll Leave Our Grandchildren is published by John Murray. In 2008 he was awarded the Edinburgh Science Medal ‘For professional achievements judged to have made a significant contribution to the understanding and well being of humanity’.